The STEM Center hosts a number of STEM events just for middle-school age girls throughout the year. Girls Tech Camp, a week-long summer day camp, includes design challenges and competitions, team building, hands-on activities, tours of labs and research areas, and networking with professional female scientists and engineers. 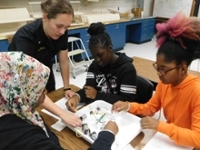 Girls Only STEM Day workshops are offered on a Saturday in March and in October, where students participate in a variety of hands-on STEM activities, and interact with female USNA faculty and midshipmen. 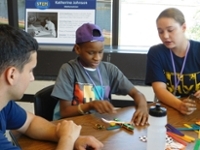 The USNA STEM Center hosts the Summer Heroes Youth Program (SHYP), a week-long day camp held at the U.S. Naval Academy each June for middle-school students from inner-city Baltimore. Led by USNA faculty, staff and midshipmen, students explore science and engineering through hands-on activities, while also learning leadership skills and participating in sports. The STEM Center and the Office of Admissions host this success oriented, project-based curriculum for rising 9th, 10th and 11th graders. Three week-long camp sessions are held in June, with over 280 students per session. Students from diverse backgrounds and from around the country stay on campus at Bancroft Hall during this residential program. USNA faculty and staff with support from midshipmen present a wide range of activities under the theme "Land, Air and Sea: Exploring Navy Technology on All Fronts", including: optimizing hull design, building circuits, cyber security, 3D simulation, storm chasing, the physics of light, robotics, and much more. SeaPerch is a national underwater remotely operated vehicle (ROV) program sponsored by the Office of Naval Research (ONR) and Association for Unmanned Vehicle Systems International (AUVSI). Each April, USNA hosts the Maryland Regional SeaPerch Challenge for middle school and high school teams. 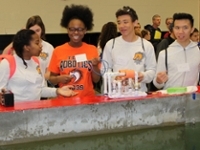 As part of classroom or after school programs, students build SeaPerch underwater remotely-operated vehicles (ROVs) and enter them in the competition. Learn more about SeaPerch. 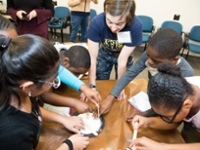 In collaboration with Maryland Mathematics Engineering Science Achievement (MESA), twice a year USNA midshipmen and faculty stage a full day of hands-on activities for hundreds of elementary students from local counties and Baltimore City at Johns Hopkins University Applied Physics Laboratory. 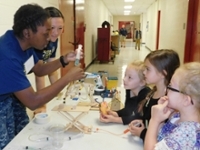 Students engage in a number of different age-appropriate interactive activities focused on topics such as robotics, hull design, fluids principles, chemistry, materials properties, and more, as well as mini engineering design competitions. 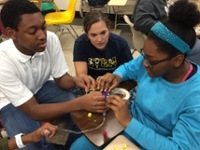 The STEM Center sponsors outreach trips for faculty and midshipmen to locations in the U.S. and around the world to promote STEM education. Recent trips include: schools in Tulsa, OK; Dallas, TX; Hawaii; St. Louis, MO; GM Tech Center in Warren, MI; Fleet Week in San Diego, CA, and more. In collaboration with the Office of Admissions, high schools from locations around the U.S. send small groups of students to visit USNA for an overnight visit or a long weekend. The students get a tour of the technical majors and spend time engaged in interactive science and engineering activities, such as experiments in the wind tunnel, investigating buoyancy in the Hydro Lab, programming robots, and more. The STEM Center hosts a booth at the biennial USA Science and Engineering Festival in Washington, D.C. In 2016, 350,000 people came to participate in demonstrations, educational activities and conferences. The USNA Booth provided about a dozen of our most popular and portable activities including mini-SeaPerch, fluids, flinkers, boats, gears, bell jars, and fun with liquid nitrogen. Faculty and midshipmen also travel to San Diego, CA to host a booth at the San Diego Festival of Science and Engineering. 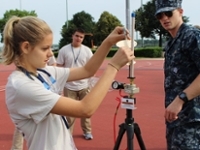 USNA faculty and midshipmen serve as judges at local and regional science fairs. 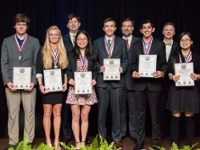 Faculty participate as judges in support of the annual National Junior Science and Humanities Symposium (JSHS) sponsored by U.S. Army, Navy and Air Force, as well as the International Science and Engineering Fair (ISEF). 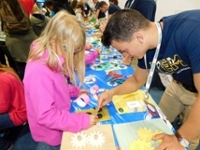 The STEM Center hosts an annual Family STEM Day each October, open for Naval Academy faculty/staff and their families to experience interactive STEM activities and explore the engineering lab spaces in Rickover Hall. Activities have included operating SeaPerch underwater remote operated vehicles, playing with TIBot calculator robots, investigating buoyancy with “Flinkers” and aluminum foil boats, launching rockets, and chemistry projects with polymers.